The new Silver Smart is the most advanced colloidal silver maker on the market. The problem with the conventional colloidal silver makers is that the concentration of the silver solution is not known and therefore, neither is the total quantity of silver. With the Silver Smart, the concentration of the silver colloid can be set between 10ppm (parts per million) and 30ppm. That is the maximum value because using electrolysis a constant quality of the silver solution can't be guaranteed at higher concentrations. 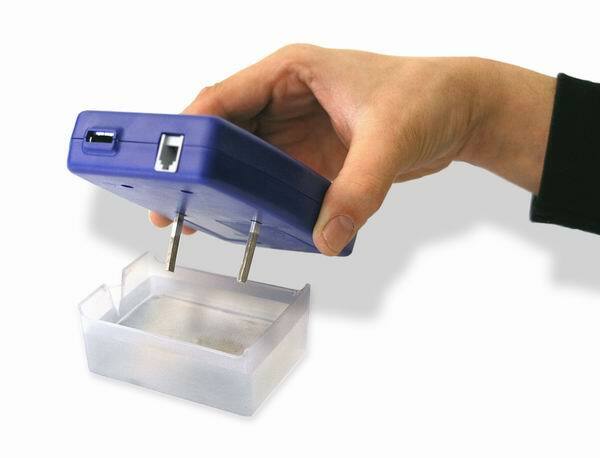 The unit measures water resistance and the room temperature to correctly determine the concentration of the solution depending on the total current flow. Without these measurements, the value would be unreliable. The concentration of the silver solution as a result of water resistance, temperature and current flow was elaborated in the laboratory. 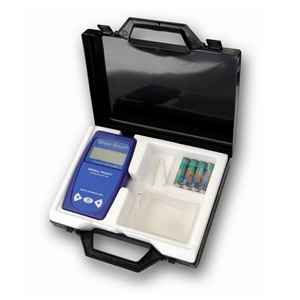 Since this unit measures and displays the water resistance (in micro Siemens), it can also independently be used as a water resistance meter. This is useful to know how light or how mineralized tap or bottled water is, and to check the functionality of a water filter. The silver electrodes are according to Dr. Hulda Clark's purity standards. The unit runs on batteries and comes with a 2 year warranty. Colloidal silver is a health supplement that is created by immersing tiny particles of silver in a colloidal base solution. Silver is thought to make the immune system more active and thereby more effective at fending off disease. It is most commonly available in a liquid form that is dispensed with a dropper. Clear or pale yellow colloidal silver is the best as the particle size affects the color of the solution and the larger particles produce a darker colored liquid but they aren't easily absorbed by the body. Colloidal Silver has been shown to kill certain bacteria, fungus and viruses and even tumor cells. It has also been shown to stimulate bone growth and promote wound healing, including in patients with serious burn wounds. The effect of colloidal silver was more effective than some standard antibiotics, yet can be well tolerated because it is absorbed high up in the intestinal tract and will not disturb the bacterial balance in the lower part of the intestinal tract. The action of Silver is cell-structure specific. Any cell that does not possess a chemically resistant wall is affected by the action of the Silver, including bacteria and other organisms without cell walls, for example the extracellular viruses. Since mammalian cells have an entirely different coating on their cells, silver has no effect upon those cells. For humans, silver has only a marginal toxicity. 2 tsp. per day contain less silver than the limit set by the World Health Organization. Dr Clark recommends the use of colloidal Silver principally as an antiseptic during and after the dental-work. Six drops on toothbrush after meals and one tbs. as mouthwash, gargle, swallow is particularly effective against Clostridium. To alleviate pain the recommended dosage to alleviate pain is: one to four tbs., up to ½ up in acute situations. 1 tablespoon after 10 minutes another tablespoon. Repeat until the pain diminishes. Do not exceed ½ cup. (120 ml). 2 teaspoons daily for 3 weeks.